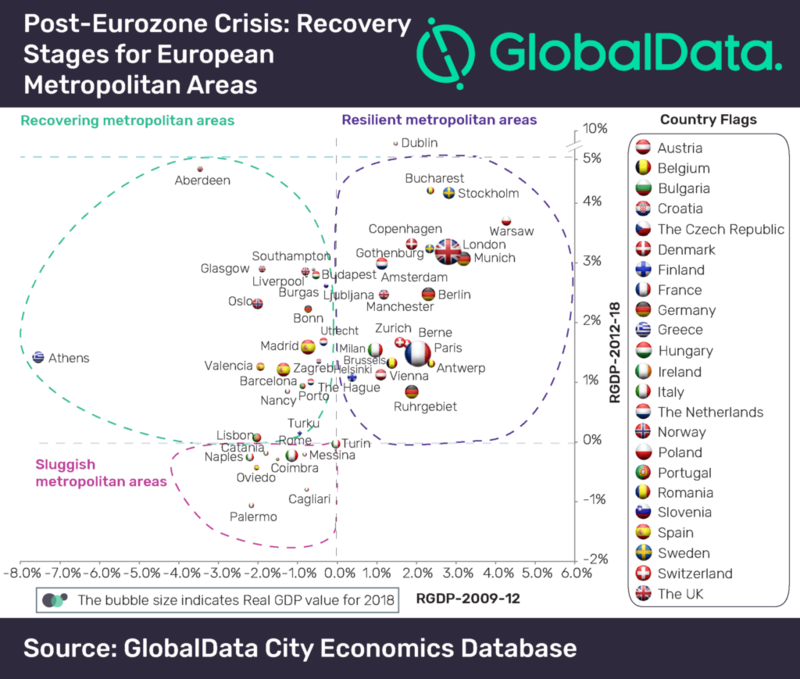 Ten years after the outbreak of the Eurozone sovereign debt crisis (2009-2012), most of the top metropolitan areas in Europe have shown signs of economic recovery, but were at different stages of the recovery path by the end of 2018, according to GlobalData, a leading data and analytics company. The company’s latest research reveals that timely monetary stimulus in terms of quantitative easing, lower interest rates for public and private lending and financial sector restructuring taken by strong economies such as the UK, Germany, France, Poland, Sweden and the Netherlands has helped the metropolitan areas in these countries to post sustained economic growth. Supported by strong investments and private consumption demand, metropolitan areas such as Dublin, Bucharest and Stockholm showed impressive average annual real GDP growth of 9.33%, 4.21% and 4.17%, respectively post-Eurozone crisis (2012-2018). A combination of adverse external factors such as trade disputes, weak global trade, slow Chinese economic growth (second major trading partner of Europe), new emission law in the automotive industry and internal issues such as uncertainties around Brexit, ‘Gilets jaunes’ (anti-government protests) in France and debt crisis in Italy impeded the growth of some Eurozone countries in 2018. This has resulted in growth moderation in some of the leading metropolitan areas in the region. For instance, the real GDP growth of Ingolstadt (Germany) moderated to 4.9% in 2018, compared to 6.2% in 2017. Similarly, major metropolitan areas of the UK including Glasgow, Liverpool, London and Manchester recorded year-on-year slower growth in 2018. Though most of the European metropolitan areas have recovered from the Eurozone crisis during 2012-2018, some were unable to recover their momentum. Italy’s Cagliari, Catania, Messina, Naples, Palermo, Rome and Turin are still struggling to stay afloat, owing to the country’s ongoing public and private bad debt, subdued export growth and high unemployment rates among their young and working age population. For instance, Milan, and Turin being hub for the export industry experienced worsening performance of manufacturing in the face of weak export demand undermining their economic growth.